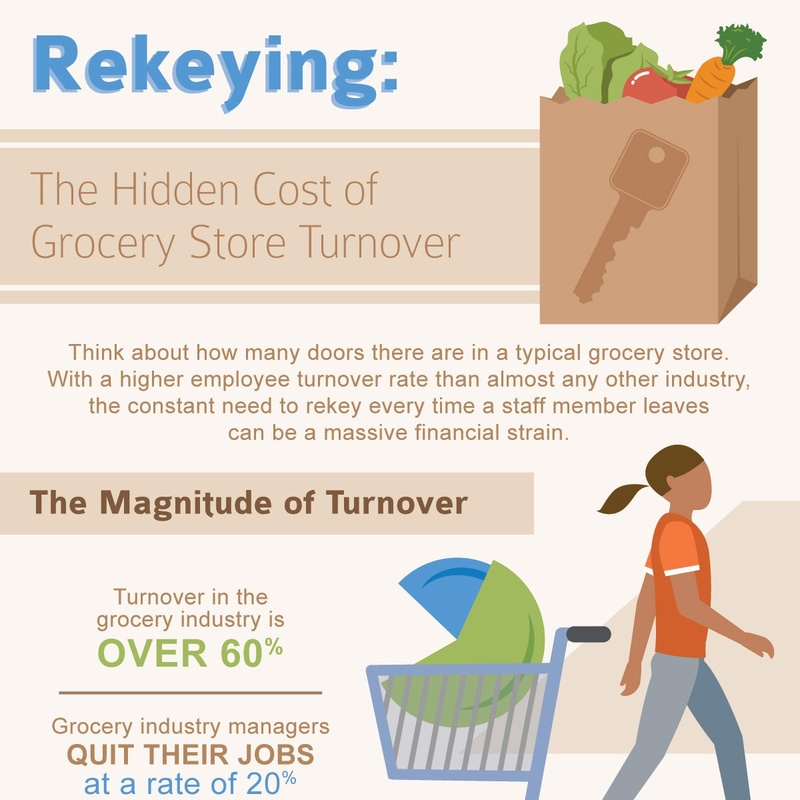 According to a recent report from Bloomberg, turnover in the grocery store industry is currently over 60 percent. When you think about how many doors there are in a typical grocery store, it can be quite a logistical and financial headache to maintain security with all that coming and going. It takes an exorbitant amount of time and money to hire a locksmith to rekey every door each time an employee quits, is fired or loses a key. An average supermarket has 17 doors and 5 master keys, and when just 1 master key is lost it can cost $1,068 to rekey. Expenses can really add up quickly, but at the same time, grocery store owners will want to take every measure possible to protect themselves against theft. Fortunately, good key control systems can offer the perfect solution. With a good key control system, each employee is given a restricted key that is almost impossible to duplicate, so managers can rest easy knowing that no unauthorized person has access to the store as long as every key is accounted for or turned in when employees leave. Each key can be keyed to access only specific areas of the store. Unique serialization allows keys to be tracked and monitored through a cloud-based key tracking platform. This platform gives managers access to information regarding what each key opens and who has access at any time via an internet connection. The InstaKey Key Control Program is not only more cost-effective than using a locksmith, but it is also far more efficient. With the help of rekeyable locks, managers can rekey a door in seconds! InstaKey clients reduce their rekeying events by an average of 50% because when keys are returned, there’s no need to rekey. In addition, with InstaKey it costs on average $36 dollars to rekey a master key loss with 5 keys. This equates to significant savings for grocery stores.